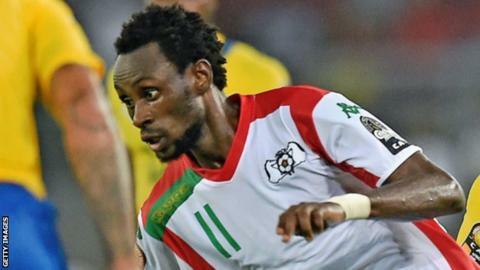 Burkina Faso coach Gernot Rohr has not given up hope of having Jonathan Pitroipa available for their 2017 Africa Cup of Nations qualifier in Botswana next month. Pitroipa, the player of the tournament at the 2013 Nations Cup when Burkina Faso finished as runners-up, has not played for his country since the German manager took charge of the Stallions. But the 62-year-old has included the winger in his 24-man squad for the Group D fixture on 5 September. And Rohr said he hopes the inclusion of Pitroipa, who plays for Al Nasr in the United Arab Emirates, will benefit the team. "He's been unavailable for different reasons like club engagements and injury but I'd be hoping [to have him for the qualifiers] because he brings a lot to the team," Rohr told the local media. "It is no secret that a fully fit and motivated Pitroipa is every coach's joy and only a few managers would deny that. "I'm sure we'll see him playing for his country again which will be exciting, but right now the ball is in his court." Rohr has also included brothers Alain and Bertrand Traore - despite the latter yet to make an appearance for Chelsea this season. There is a maiden call-up for Algeria-based Patrick Malo and a recall for veteran defender Paul Koulibaly. The squad will report for a three-day camp in Paris on 29 August before flying out to Johannesburg, South Africa four days later. Rohr also revealed that the Stallions will travel by road from South Africa to the capital Gaborone on 2 September before the hour-long drive to match venue Lobatse on the eve of the game. Burkina Faso made a strong start to their qualification campaign in Ouagadougou, beating Comoros Islands 2-0 in their Group D opener in June. Forwards: Alain Traoré (Lorient, France), Préjuce Nakoulma (Mersin İdman Yurdu, Turkey), Jonathan Zongo (Almeria, Spain), Jonathan Pitroipa (Al Nasr, UAE), Aristide Bancé (Chippa United, South Africa), Fadil Sido (FC Metz, France), Issiaka Ouédraogo (Admira Wacker, Austria).